If you submitted a review to any FPA review page and it didn't show up after 5 business days, please go to Hey Dude, Where's My Review? Read the post. If that doesn't explain the issue, fill out the form on the page. Someone on the review moderation team will get back to you. Other questions about the FPA or need to get in touch with us? Visit the FPA's FAQ and Knowledge Base. One of the only true and real websites about investment companies reviews that is not a total lie, and that does not sell for money to scammer brokers. Biased forum with slow and amateur moderators. I've written a review for a community, but didn't got accepted yet. It really is a shame how you accept mainly good reviews for that community of scammers. But don't worry, I'll keep writing until it gets accepted. People like you are why the FPA has to moderate the reviews. You were banned for bragging about illegally sharing copies of commercial materials. No matter what your opinion of a company is, you were openly admitting to committing a crime. The FPA has no tolerance for pirating commercial products whether or not the products are scams. Now you've created a second account to try to keep going after the same company and to attack the FPA. Banned means banned. It does not mean create another account and try again. You can't even get your facts straight. Every review submission comes with a notice that reviews can take up to 5 business days to be approved. You submitted this attack on the FPA only 4 business days after submitting a new review. Hey Dude, Where's My Review? Read the text posted there carefully. If that doesn't explain the issue, please fill out and submit the form. Someone from the Review Moderation Team will write back to you. I have been reading through different ways how FPA handle reviews and i can see a sense their sincerity with their mission! Good job! I had problems with a broker before but was later resolved only when i brought my reviews to FPA then Avatrade made the action to resolve my case with them. Kudos FPA! I am sending clients to rate my service to you all and you dont post most of them!!!! and file complaint, witch they did , and only ones client complaint was answered and got posted ! I resewed plenty screen shuts from clients , that my ratting was don and that it is going to be looked at and posted with in the 3-6 days and weeks later nothing is don ! Here is my email j.honcharuk@avatrade.com I would be glad to send you the screen shots from my clients ! Out of 21 reviews that was don only 7 got posted ! One review was added after clients complain was answered , and that is it ! where is the rest of reviews ? Why you dont post them? I'm in charge of the FPA's reviews. I've checked every message sent from the "Hey Dude, Where's My Review" page for missing for 2018. There were only three from AvaTrade reviewers. One resulted in approval. The FPA is waiting back from the other two. There are two very strange things about your claim. First, someone else just emailed in from AvaTrade with the names and account numbers tied to a number of "missing" reviews which were supposed to have been submitted and which also were supposed to have filled out the missing review form. Two had filled out the form and have been replied to. Two appeared to have reviews which were deleted within guidelines, but have not filled out the form. The remaining five names and account numbers do not match any reviews submitted for AvaTrade and have not filled out the form. The second strange thing is that one of your "clients" claimed to have left a review for a non-Forex company. This sort of mixup is often a sign of a possible paid review spammer who got confused over which review was left on which website. As I have said, only 3 AvaTrade clients have submitted that form in 2018. You should also ask your clients to share more about their experience with AvaTrade than things like "I opened an account today and I love John Honcharuk." You may be the best person in customer service, but it's like a restaurant review telling how great the waiter is before the food is even served. Instead, let them trade for a month or two before asking them to give an honest opinion of both AvaTrade and the service you provide. FPA got me my €1k back in 3 days ! I had been waiting for over 5 weeks for 10Brokers to execute my €1k withdrawal and wasn't getting anywhere. Then Forex Peace Army came into action and already within 3 days the broker paid out ! FPA does a fantastic job in the fight against dodgy brokers and other scammers - keep up the good work FPA, we need you ! Website requested my email address for a list of the 10 worst brokers, complied, then the email I received was simply one soliciting me to subscribe to a list. I subscribed, under the impression that I would receive the list to no avail. I believe this is called a "phishing scam". I think you need to recheck the definition of phishing. Even if the offer of the brokers report was fake, all it got was an email address. Phishing is an attempt to get passwords and ID information. The FPA does not do phishing of any sort. Please click here, say you didn't get the 10 Worst Brokers report, and give the same email address. I will check with the coders to see if anything went wrong on this end. I will also personally send you a copy of the report. FPA violates review site laws / code of conduct. The FPA violates the law in taking a position on review pages when labeling things a "scam" but also promoting other brokers through IB links. This creates a conflict of interest and violates many laws. It's perfectly legal to have 3rd parties bash companies, etc - that's protected. But when you get into it and call them "SCAM" etc and PROMOTE other brands to make money off of, that's illegal and first amendment US protections are lost. Ask any internet / US / European attorney familiar with the matter. There is no doubt the FPA is a great source of reviews, but they interject themselves too much creating bias. No other review site of hotel, or Forex, becomes so involved in the review page of a company for this reason. FPA needs to better familiarize themselves with internet laws. I am in charge of content in the FPA's forums and reviews. Per US FTC guidelines, the FPA clearly discloses the presence of advertising and affiliate relationships in its Terms of Service. Unlike many review sites, the FPA does not allow this to interfere with the handling of reviews. More than one advertising contract was cancelled due to the company mistreating FPA members. More than one affiliate relationships was cancelled due to the company mistreating FPA members. Some of these companies were very surprised to find themselves getting a well-deserved Scam label. Many companies have offered to pay for large advertising contracts, if the FPA would remove negative information. Each was turned down. Advertising contracts buy ads, not special treatment. This comes up so often, it was necessary to add it to the FAQ to reduce the number of companies asking. If you can name a specific US law you feel the FPA has broken, use the Contact Us link to send me the URL of the law along with the exact part of the page you are referring to. It will be checked. If you can think of a way to run the FPA with no affiliate relationships or advertising contracts, use the Contact Us link to send your plan. If it makes sense, it will be considered. I joined this company long time ago and have found invaluable for beginners and those that would like to educate themselves in various aspects of trading. I highly recommend this site for those that have been suffering in silence under the oppression of fraud-star companies like Goptions. I would like this site to do more frequent reviews of companies that are susceptible to fraudulence. This is because this site gave a positive rating of Goptions back in June last year, which was the more reason I registered with the options company. The FPA does not give the ratings. Reviewers give the ratings. We go to great effort and expense to weed out as many fake reviews as possible. It is always possible for a good broker to turn bad. It is also possible for a good broker to make mistakes with one person's account. In this case, GOptions had only a single 5 star review. All the other reviews before and since have been negative, except for the clearly labeled fake review submitted from the broker's office. 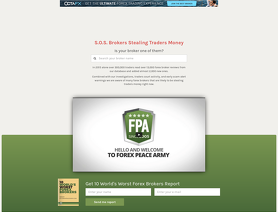 The site was labelled as a scam by the FPA in 2014. If you saw a large number of positive reviews for GOptions, you were on some other review site.